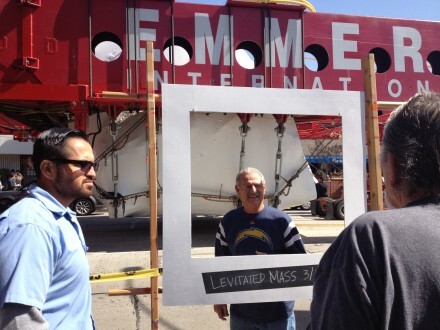 View of frame to have picture taken with boulder in Bixby Knolls on March 7, 2012. Images on site for Art Observed by Megan Hoetger. 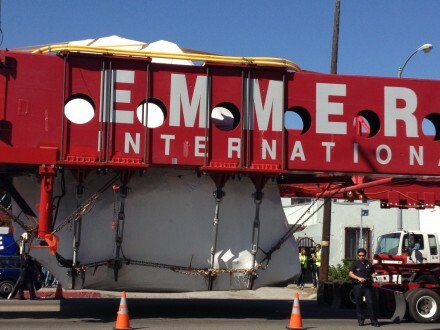 On Saturday, March 10 at approximately 3:00 am the 340-ton granite megalith that will be part of Michael Heizer’s Levitated Mass reached its final destination at the Los Angeles County Museum of Art (LACMA). 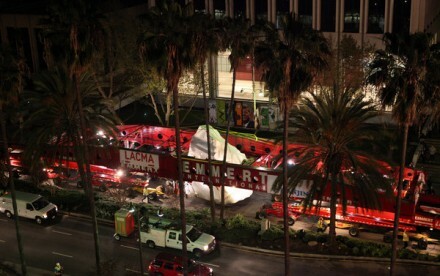 Traveling for eleven days in the dead of night through Riverside, San Bernardino, Orange, and Los Angeles Counties, the rock arrived at LACMA to a crowd of a thousand onlookers. The megalith’s final resting place is atop a 465-foot long slot carved into the earth. Viewers will be able to walk down into the slot and underneath the rock, experiencing scale in a way that harkens back to ancient times when massive structures such as Stonehenge, Easter Island, or the Great Pyramids were constructed. Conceived by Heizer in 1968, Levitated Mass had been in production for nearly four decades until six years ago when the appropriate boulder was found in Stone Valley Quarry in Riverside, CA. At 340 tons (approximately 680,000 pounds), the boulder is the largest object to ever be moved on land and, as a result, the trailer moving the piece is one of the largest ever constructed. Stretching for nearly a city block, the scaffolding of the trailer surrounded the rock, holding it place as if it were floating in mid-air. The numbers alone are astounding: 105 miles along a circuitous route (on freeways it would have been about 55 miles); four to five mph for roughly four hours per day over eleven days (for a drive that would usually take just over an hour going 65 mph); 22 cities; 340 tons; hundreds of people, including police escorts, road safety crews, and Emmert International staff, among others; over a year of work obtaining permits and planning the route; and approximately 10 million dollars of private funding for the project. In practice, the spectacle amounted to an elaborate and massive red scaffolding structure around a giant, ambiguously formed white mass. View of boulder in Bixby Knolls on March 7, 2012. 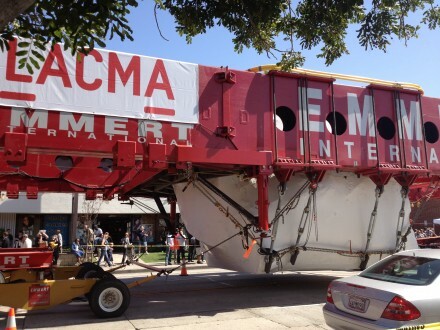 Onlookers marveled at the sheer scale and the feat of engineering as the levitated mass filled nearly an entire street, slowly making its way down the otherwise banal streets of the Los Angeles urban sprawl. In Bixby Knolls, the community coordinated a street festival, coined “Rock-a-Palooza,” that included street artists, activists, bands, and DJs playing “rock” music (the B-52s’ Rock Lobster for instance), also involving the local businesses along the stretch of the boulder’s route. Visitors could wait in line to have their pictures taken with the rock, and one group was even selling commemorative T-shirts. 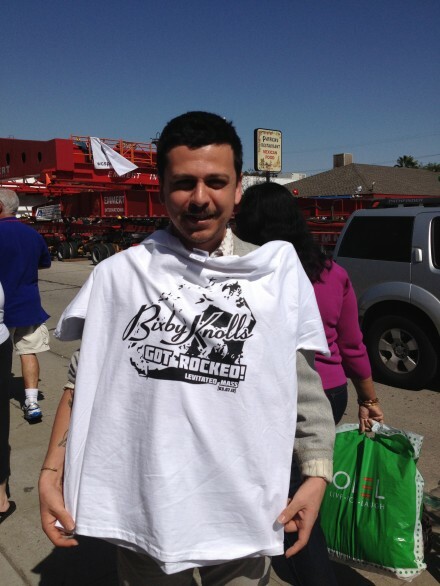 Commemorative T-shirt for sale in Bixby Knolls on March 7, 2012. The mood in Exposition Park was much more interventionalist. Parked on a largely residential street, people in the neighborhood, according to one woman whose house was directly across from the rock, were not notified prior to the trailer’s arrival around three o’clock in the morning. Instead of a planned community gathering, people from the neighborhood and visitors following the rock ambled around in an uncontrolled mass. Much to the police escorts’ chagrin, many onlookers went right out to the rock and had their pictures snapped holding on to the scaffolding. 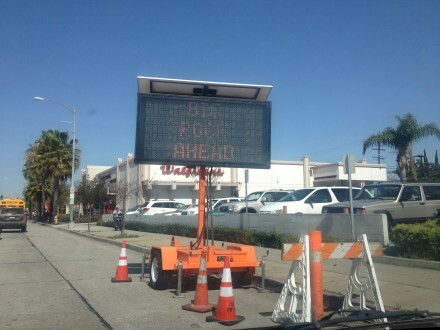 Road sign as traffic approached the boulder in Bixby Knolls. While the general onlooker may not have known much about the rock’s final destination, its origin, or Heizer’s practice, its journey became a point of access into the museum for many whom otherwise would not typically interface with such “high art” institutions. The initiator of this project, LACMA director Michael Govan, drew a great deal of visibility to the museum over the course of the eleven days—in addition to the thousands of people that gathered at the rock’s nine locations and the countless drivers passing by, there were also non-stop twitter feeds, Flickr images, and blog updates, as well as news and media attention. 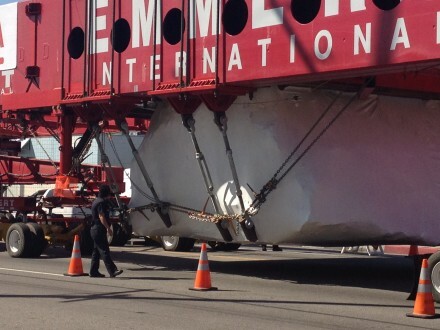 The boulder moves down Wilshire Boulevard nearly at it final destination. Via LA Times. Stopping in cities across the southland during the day, the boulder’s journey offered Angelenos a different view of the Los Angeles area than most normally see. Usually cutting through several anonymous cites at around 70mph (if lucky), the geographic and social landscape of many areas go unnoticed. Commuters in Riverside County where the rock began, for instance, might drive the 55 mile stretch for their entire lives and never necessarily know where it is they roll through on their way to and from work. The megaliths winding journey forced a perceptual slowing down in a car culture used to speeding along. 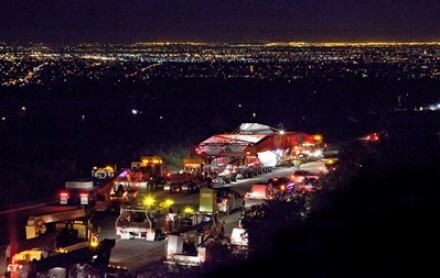 Michael Heizer’s arrival plans for Levitated Mass. Via LACMA. 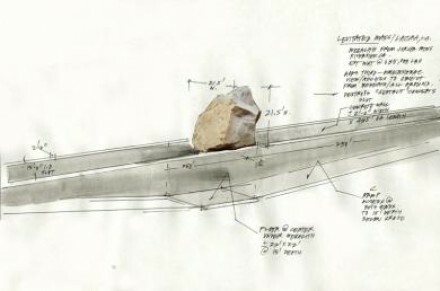 Michael Heizer’s preliminary drawing for Levitated Mass. Via LACMA. The Roanoke Times (Roanoke, VA) February 8, 2006 | Claire Guzinski Cave Spring High School This Valentine’s Day, don’t sweat it if you can’t afford the greatest gift. As long as the day is special and you show your date how much you care, he or she is sure to appreciate anything. Blanket Candle and holder or votive A single flower (in season) Food for a picnic Good weather is necessary for this date. Upon picking up your significant other from school or work, blindfold him or her. Help your date to your car and drive to a site on the Blue Ridge Parkway. Take your date’s hand and lead him or her from the car. Then break out the blanket. With your date still blindfolded, begin setting the picnic dinner, laying a flower next to your sweetheart’s place. Light a candle and place it in a votive. Remove the blindfold and let your date take in your gesture. Pizza Beverage Candle and holder Champagne flutes or regular glasses A good flick A single flower (in season) Order a pizza with his or her favorite toppings (just the ones that you can stand.) And make sure it arrives before your date does. Set out a candle and a single flower in a vase to make this pretty-average date something special. Place a bottle of his or her favorite drink next to the candle. Get your parents’ permission to break out the champagne glasses for an extra touch of elegance. It’s likely that he or she will appreciate your resourcefulness, and you can avoid spending $16 on movie tickets. Notecards Time Prize (for example, flower or candy) If your valentine has to work on Feb. 14, never fear. Create a scavenger hunt around your date’s car or workplace for when his or her shift is over. Put the first hint on the windshield so your sweetheart is sure to see it. Have the hunt continue from there. 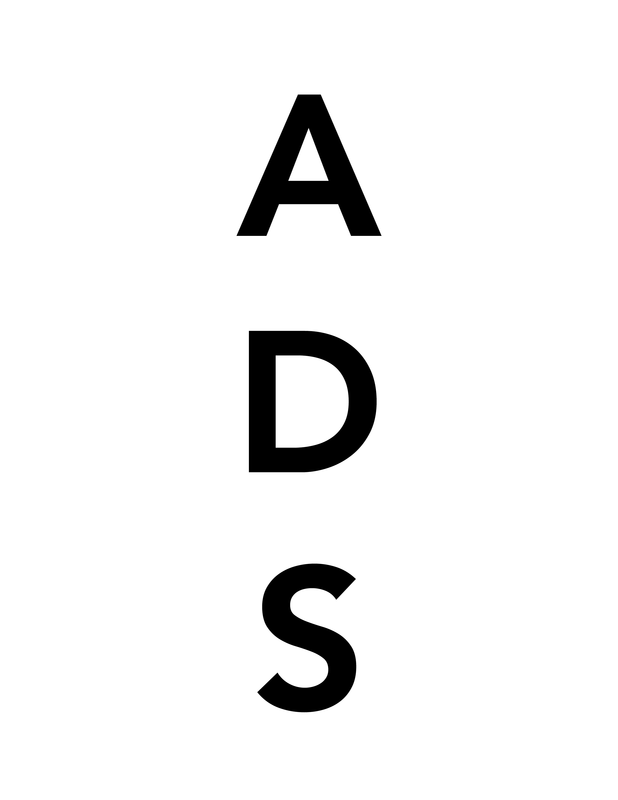 This entry was posted on Thursday, March 15th, 2012 at 11:52 pm	and is filed under AO On Site, Art News, Go See. You can follow any responses to this entry through the RSS 2.0 feed. You can leave a response, or trackback from your own site. If and when Cuba emerges from the Castro era the vintage cars will be a huge draw for tourists. As mentioned earlier they are truly “folk art” and should be preserved as such.